WASHINGTON – The United States Mint (Mint) will open sales for the 2018 Preamble to the Declaration of Independence Platinum Proof Coin (product code 18EJ) on January 25, 2018, at noon Eastern Time. This coin is the first release in the three-year (2018-2020) Preamble to the Declaration of Independence Platinum Proof Coin Series. The series features all new obverse (heads) designs, as well as a new common reverse (tails) design on a one ounce, 99.95 percent platinum proof coin each year. The series portrays Liberty planting seeds for future sustenance, lighting the way westward, and harvesting the well-worked crops. The inscriptions “Life,” in 2018, “Liberty,” in 2019 and “Happiness” in 2020, are in the likeness of the handwritten words from the Declaration of Independence. Artistic Infusion Program (AIP) Designer Justin Kunz created all the obverse designs of this platinum proof coin series. The 2018 platinum proof coins were sculpted by United States Mint Sculptor-Engraver Phebe Hemphill. The coins’ common reverse design for this series depicts an eagle in flight with an olive branch in its talons. 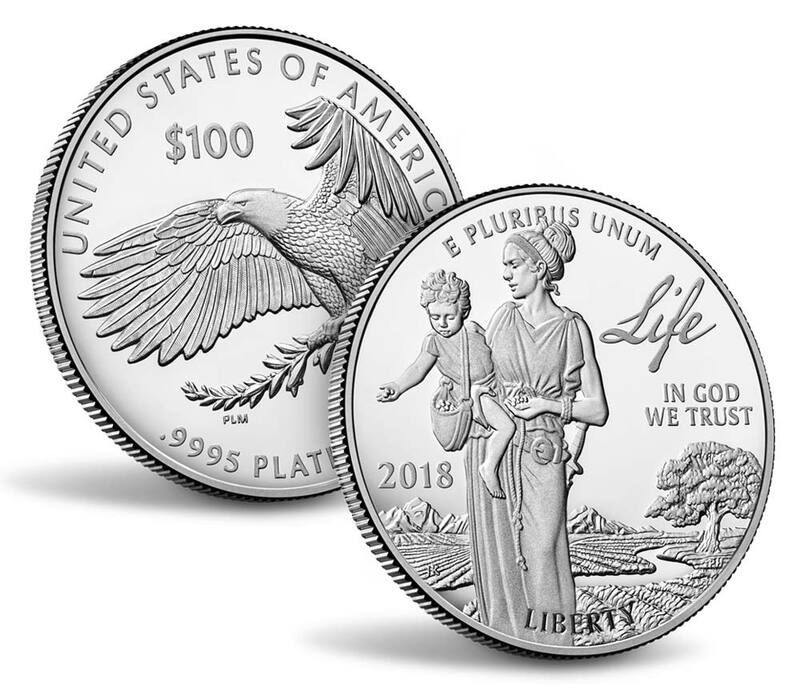 Inscriptions are “UNITED STATES OF AMERICA,” “1 OZ.,” “.9995 PLATINUM,” and “$100.” AIP designer Patricia Lucas-Morris created the reverse design, which was sculpted by United States Mint Sculptor-Engraver Don Everhart. Produced at the West Point Mint, this coin is packaged in a black velvet satin-lined presentation case with outer box and sleeve, and accompanied by a Certificate of Authenticity. As with all Mint products containing a precious metal, this coin will be priced according to the range in which it appears on the Pricing of Numismatic Gold, Commemorative Gold, and Platinum Products table. Current pricing information is available online at catalog.usmint.gov/coins/gold-coins/. Orders will be accepted at catalog.usmint.gov and at 1-800-USA-MINT (872-6468). Hearing- and speech-impaired customers with TTY equipment may order by calling 1-888-321-MINT (6468). Information on shipping options is available at catalog.usmint.gov/customer-service/shipping.html. The 2018 platinum proof coin mintage is limited to 20,000 while orders are initially limited to one coin per household. This product may also be available at various United States Mint sales centers once the household order limit is lifted. Coin Collectors Blog and Coin Collectors News is licensed under a Creative Commons Attribution-NonCommercial-ShareAlike 4.0 International License by Scott Barman.